Be a part of sustaining the work of Portland Story Theater. Offsetting operating expenses that are not covered by the low cost of our tickets. Supporting our on-going immigrant and refugee program. Want to be a part of a group of people who get together to celebrate story, participate in super cool events, and just have fun with other story lovers? 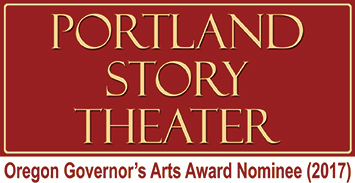 When you become a member of Portland Story Theater’s annual program of recurring monthly giving at the basic level of $20 for individuals and $30 for couples, you are automatically enrolled in the exclusive NARRATIVE NETWORK. Being a part of this group includes great incentives, like fun, shared experiences with Lynne Duddy and Lawrence Howard, the founders of Portland Story Theater, the chance to party together, tell stories around the campfire or over cocktails, and see previews of shows at the home studio! Two Reserved front-row seats at every show!